In my last blog I described the colour of hydrated cobalt (II) chloride, CoCl2.6H2O as deep purple, but the more I look at it, the more burgandy red it appears. So I think I’ll settle for a burgandy-purple or ‘burple’ colour. Of course, I just made that up, but it does illustrate the problem of describing in words the colours we see with our eyes. For the chemist, this includes the problem of describing the many varied colours of transition metal salts. I also asked last time what was the standard test for hydrogen gas in the school chemistry laboratory. It is of course, the burning splint test. More often this is referred to as the hydrogen “pop” test, because introduction of a burning splint into the gas causes it to burn with a small explosive “pop” and this is shown below. The hydrogen was generated by adding a small length of magnesium ribbon to dilute hydrochloric acid. Another way to ignite the hydrogen is to use a piece of platinum foil that has been heated red hot in a Bunsen burner flame. This is shown below. Unfortunately, the flame produced was still coloured orange, presumably due to trace amounts of sodium and other contaminants. Hydrogen is reputed to produce a colourless flame. In both of the above explosions the hydrogen gas is reacting with oxygen gas in the surrounding air. Oxygen can be generated in the school laboratory by the decomposition of hydrogen peroxide solution, catalysed by manganese (IV) oxide. The test for oxygen is to use a glowing splint which rekindles in the oxygen gas and bursts into flames. What is the test for carbon dioxide gas in the school chemistry laboratory? 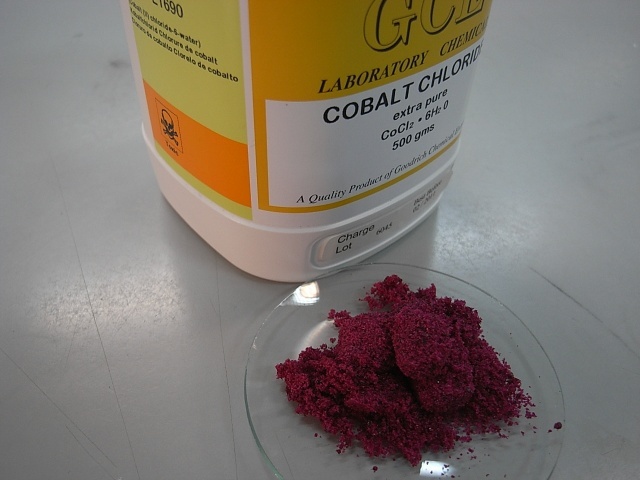 Cobalt chloride is another transition metal salt used to test for water. In fact it is the colouring agent added to silica gel for use in dessicators which I mentioned in my January 31st post. Hydrated cobalt chloride has the formula CoCl2.6H2O and is deep purple in colour. This is what turns cobalt chloride paper pink when wet! Cobalt chloride is also toxic. Safety precautions must be employed to avoid contact with skin or inhaling its dust. Always use gloves and a fume cupboard when dealing with cobalt chloride or silica gel impregnated with it. Cobalt chloride test paper can be used to test for water. Here the blue dihydrate form of cobalt chloride turns pink on addition of water and then back to blue again when heated. Having covered chemical tests for water in my last two posts, what is the test for hydrogen gas in the school laboratory?